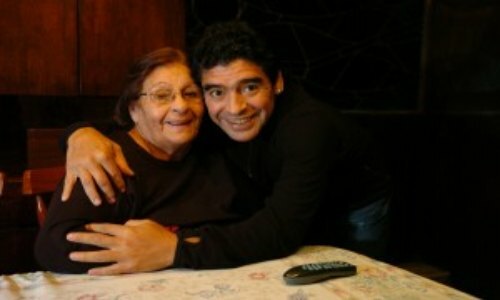 Diego Maradona's mother passes away. She was suffering from severe cardiac problems. Dalma Franco De Maradona (Dona Tota) was aged 81 when she dies. Dona Tota had been hospitalised since Friday at Los Arcos Hospital in Buenos Aires. Of her eight children, Maradona is her 5th son. Maradona, now coach of UAE club Al-Wasi, was in Al Ain for his Etisalat Cup Match. Upon hearing his mother has been hospitalised, he returned to Argentina along with his sisters and daughter Gianina. The news of her passing away reached him at flight on the way to hospital. A minute's silence has already been observed during the Argentine Primera Division match between Independiente and Olimpo. 0 Response to "Maradona's Mother passes away"